The way everyone of us reads and responds to a story, book or a newspaper article is different. I think American Psycho describes an utterly compelling fantasist, while my friend found the unrelenting lists…well, tedious But the point is we were happy to argue about it for ages. In May 2011, Amazon announced it had sold more Kindles in the previous 12 months than paper or hardback books. 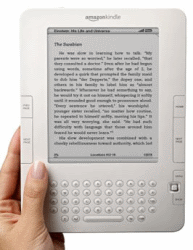 With this rapid change (the Kindle was launched in November 2007), comes a revolution in reading. The Kindle is opening a whole new way to connect across the web, sharing what you love to read with a very exclusive group. I can lend a Kindle book to another Kindle friend very easily, for 14 days and with no extra charge from Amazon.com. Sites like lendle.me allow US Kindlers to earn a small fee by lending books for free to other tablet users, using Amazon.com’s API. But discovering another reader’s thoughts on a particular passage through a ‘highlight’ in a Kindle book creates a completely new connection. I can tell my followers on Twitter about the books and passages I find useful, making a very personal link to people I may not know but have a very specific shared interest with. Will other people’s view of what they like, hate or just found interesting in a book change the way that I’ll read it? Undoubtedly. This, of course, is all grist to the mill for Amazon. Building a Kindle community who actively debate what’s hot and not is a great way to drive sales too. Spreading the Kindle brand out across the web and knittting it into Twitter, Facebook, etc al is a great piece of positioning, awareness and marketing. Along with the ad supported business model, the hardware barrier is going to get ever lower. Making the Kindle device cheaper for those who want it and letting users share books and thoughts for free will ultimately be a positive for Amazon – and change the way we read forever.